The Goverlan Reach Client Agent must be installed on every client machine that needs to be managed with Goverlan Reach, our remote access software. The agent is very small (about 15 MB), stable and secure. It will not affect system performance. Pushing the Goverlan Reach Client on remote systems can be done in many ways depending on if the remote system is within your organization or over the internet. This article describes information about the deployment and maintenance of the Goverlan Reach Client. The Goverlan Client Agent currently only supports the Windows operating system. It can run on Windows XP SP3 and later versions of Windows. It supports both 32-bit and 64-bit architectures. Client agents for other platforms are currently under development; please check with our support department for updates. The Goverlan client agents expose the network port 22000 by default. This port is used for client communication. All communications to the client agent are encrypted, authenticated and audited. If a firewall exists between your machine and the remote machine, the firewall must be configured to allow the Goverlan Client Agent port communication. Upon starting, the Goverlan client agent automatically configures the local firewall to authorize communication on that port (this behavior is configurable by policies). It is possible to change the agent ports to a value of your choice using a Group Policy Object or a Goverlan Reach Server policy. See Network Ports used by Goverlan Reach for further information. Within your organization, the Goverlan Client Agent is automatically installed and maintained on a per-needed basis by the Goverlan Operator Console. Upon accessing a remote system, Goverlan prompts you to install the agent if the remote machine is not equipped with it, or provides you with update options if applicable. You can control the prompt behavior via the Reach Client Agents section of the application settings. The Remote Registry service or WMI Management must be enabled on the remote machine. In the event you wish to pre-install the Goverlan Client Agent on your machines, you can use one of the following methods to push agent installation on one or more systems. 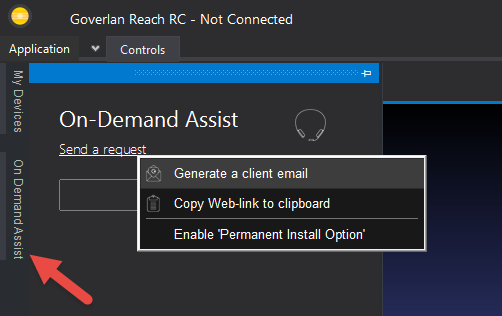 Within the Goverlan operator console, right-click on any computer object and select the desired Reach Client Agent action to perform. The Goverlan Agent Manager can be accessed from the Application menu of the Goverlan Reach Operator Console or the Goverlan Reach Server. 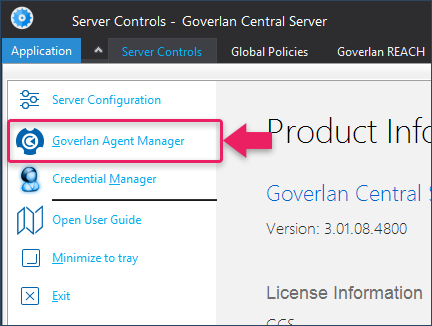 The Goverlan Agent Manager can be used to deploy, update or remove the Goverlan Client Agent on one or more remote machines. It can also be used to push some configuration to these systems. You can pre-install the Goverlan Client Agent via an installation package that is distributed to your machines and ran manually. A Goverlan Client Agent installation package can be generated as an MSI or EXE using the Goverlan Agent Manager. These installers can also be pre-configured with specific settings before being generated. Goverlan Client Agents can also be managed using a Goverlan Process Automation. Create a Goverlan Process Automation and define a computer scope. When configuring the Process Automation Actions, select the desired task under the Goverlan Agents category of the Execute section. To manage machines over the internet the Goverlan Reach Gateway services must be enabled. Once configured, the Goverlan Reach operator console auto-displays a new side panel named On-Demand Assist. This panel is used to initiate On-Demand assistance sessions, or to install the Goverlan Client agent as a service, enabling unattended remote management of that node. Open the Goverlan Reach operator console or Goverlan Reach RC. Open the On-Demand Assist side panel and click Send a request, then select Generate a client email. To enable unattended installation, confirm that Enable Permanent Install Mode is activated before generating your client email. Once the remote user receives the email and runs the downloaded executable, the user will be prompted to choose an execution mode. On-demand access provides you with full remote management services of a computer over the internet while the session is active. Remote management services are not restricted to a remote control session, the full set of Goverlan management services can be used during an on-demand session. To gain local administrative access to the machine during the assistance session, ask the remote user to enable the provide administrative access option. This option is required if you wish to handle UAC acceptance prompts. Instruct the user to click on the Start Support Session button to initiate the remote assistance session. This will generate a session ID that you must enter in the Goverlan operator console to connect to the session. Once the session is connected, you will be able to perform any management tasks on this node, including remote desktop access, software deployment, task management, etc. To close a remote assistance session, the remote user must close it by clicking on the Cancel button of the session window. To perform an unattended installation of the Goverlan Client Agents, instruct the remote user to enable the Authorize Permanent Access option then click on the Provide Unattended Access button. 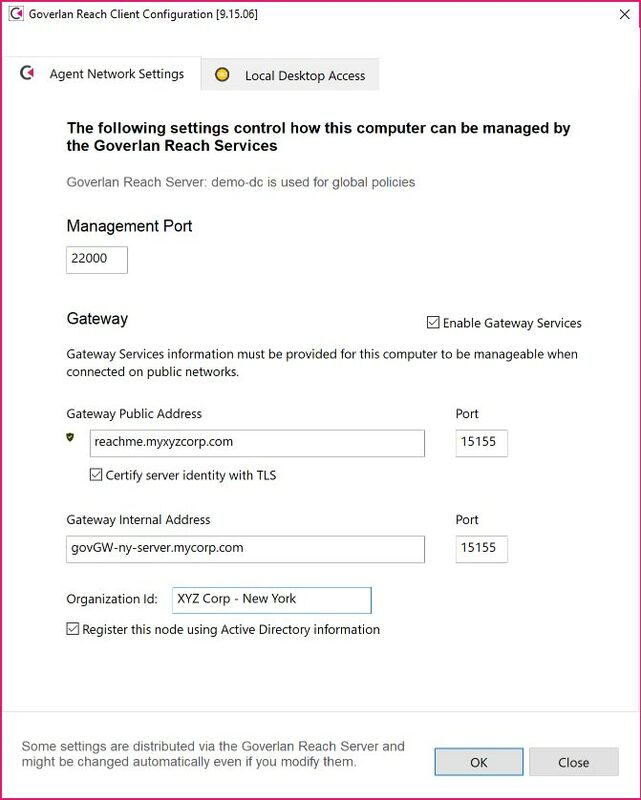 Once installed, the machine automatically registers itself to the Goverlan Reach Gateway services and is available for unattended management under the External Devices section of the Goverlan Reach operator console. External unattended nodes are configured with an Organization ID. This organization id is used to group external nodes in containers for easy browsing in the Goverlan operator console. The default organization ID is set to the Organization Name configured in the Gateway services. However, it can be modified in the Goverlan Client Control Panel applet. Once a machine is equipped with the Goverlan Reach Client Agent, a configuration control panel applet is accessible. This control panel applet can be used to review and change the configuration of the agent on the local machine. Defines the communication port used to communicate with this endpoint as well as the gateway services configuration (if enabled). Defines the user acceptance configuration and behavior of the agent during a remote desktop access session. For instance, the agent can be configured to prompt the local user to approve a session before it is started, or accept the session automatically and display a notification message, or disable remote desktop access entirely. Client configuration, behavior, and branding can be centrally configured using the Goverlan Global Policies feature of the Goverlan Reach Server. Once Global Policies are enforced, the control panel applet will not allow the modification of the client configuration.